On Wednesday Morning the eastern sky was all red before sunrise and I took the warning and packed up camp and hustled over to Lightning Lake. At that early hour I spotted a cow moose swimming across the small connecting lake. With the skies looking stormy and the wind coming up a camp spot was selected near where a short trappers trail should lead to the next lake on Royd Creek. 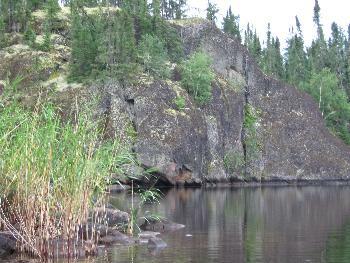 A storm proof camp was set up and then it was time for an exploration of the portage. By crossing the narrow neck a few times I was able to find the trappers path but it had so much blowdown on it that I selected a route nearer the stream. On Lightning it starts on river left, climbs a mossy rock into the woods and parallels the creek. Nearing the other side you end up back on the creek about 20 meters from the lake. An old blaze marks this spot and the walk out to the sandy shore of the lake is made easy by flat stepping stones in the bottom of the creek. The stepping stones are so perfect it is hard to believe that they were not laid there by someone in the past. With the first leg of the journey out of here laid out a return to camp for lunch was the logical thing to do before tackling the much bigger second leg. Claire has told me that there is an overland route to the next lake and given me its approximate route. After lunch and some caffeine to enhance the search the first portage was made and a search of the opposite shore with no sign of a trail being spotted. A lot of steep rock narrowed the possible places for the route. A long way south of where I assumed the route would be a trail up the smooth rock was spotted and looked like a sure thing but came to a sudden halt. With the GPS I aimed for the spot on the next lake where the trail should come out and started exploring. Nearer the other side the topo map showed a saddle that any trail maker would use for a route. At the saddle I was able to pick out a straight route down to the lake but did not pick out any of the old trail until I started back up from the lake. Once I got on the trail I spotted frequent blazes and logs that had been cut. When I got back up to the saddle the blazes disappeared until I pushed through some Alder I was hoping to avoid. The country between the lakes is really rough with a lot of steep rock impeding your travel. The trapper's trail stays on a nice route through the area but has to loop around an area impassable for a snowmobile. The blazed trail climbs to the high rock on some smooth open rock runs and then dives down to the spruce bogs below. In the spruce I lose the trail a few times but stumble back onto it by maintaining the general course. In the worst place it is really wet and obscure because of the alder. It then goes through more spruce but is open and easy to follow until it nears the lakeshore where the brush again has overgrown the trail. 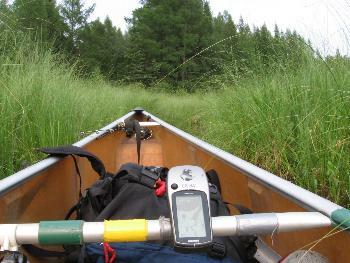 When I get to the water my canoe is only 100 meters away on the false trail I had spotted. The wet area in the bog is the only problem with using the trail but by hugging the rock to the north of the boggy trail you can bypass the worst part and then cut back to the old trail. It has been quite a few years since the trail has been worked on but does make a nice 1600-meter travel way through some hard to travel terrain. A little extra sleep came easy Thursday as rain pattered my tent and distant thunder rumbled. By the time my tea and cereal had been consumed the rain on Lightning had ceased. The rumbling thunder to the NW continued as an exploratory excursion on Lightning got under way. 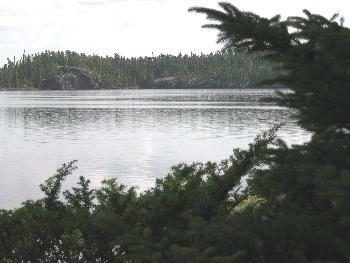 Lightning is a fair sized lake but with all of its islands and abundant bays it makes a scenic lake to cruise. A high rock face on the south side tempted me but I did not climb it. There is supposed to be a trappers cabin here but I did not spot it. When I get to areas like this I am glad the trip in supplied for 30 days. There is no rush to move on as on shorter trips. I want to check out the creek passage to the next lake but feel that the trappers trail through the woods would not be there if the creek can be used to access the next lake. As I study the creek and the next lake on the topo maps I am impressed with all the contour lines ringing the next lake. From what I interpret from the paper it looks like it may warrant a lengthy visit rather than just a paddle through. I wanted a fish fry and tried jigging a Kastmaster for Lake Trout as a breeze pushed me toward the big cliff on the south side of the lake. Lake Trout never took my lure and I do not even know if they inhabit the lake. 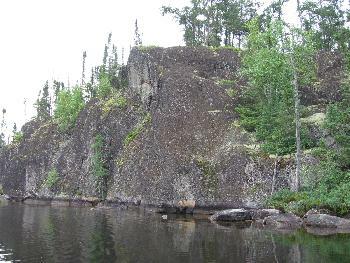 On my morning cruise I noted that a large boulder field extended out into the lake near the cliffs. Changing to a Dardevel for this habitat I soon had a Northern for lunch. With another fish fry checked off of the 20 that my trip menu has on its schedule it was time to explore the creek leading to that steep walled lake on Royd Creek. 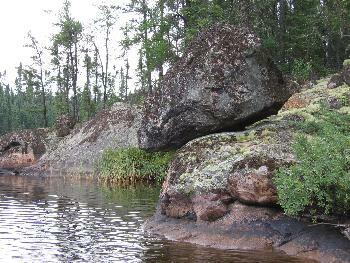 There is a short portage around a rapids as Royd Creek exits the next lake. The trickle of water flowing from Lighting had convinced me that the creek would be an Alder choked and boulder strewn flowage that would be of no use in canoe travel. A walk along high rock walls that parallel the stream showed how wrong my assumptions were. What I saw was a narrow but sufficient stream filled with enough water for good canoe travel. There was very little Alder, no boulders and not much winding from side to side. 700 meters downstream there was an old beaver dam that would require a short portage to get back on a good channel. The dam had been there for generations and every time it failed it would carve a small new channel that would find its way back to the old channel after a few hundred meters. This discovery is great news for anyone wanting to travel up Royd Creek and fish for Walleye on Joey Lake. Just ten short portages from Royd Lake will get you into this seldom-fished lake. The Royd Creek portages are not on the map but are easy to find as they all parallel the creek. The coordinates for those portages and all the other points of interest in this journal will be included in the last section. It will also be there as a Garmin file that you can download and open if you have the Garmin software. It is then only a few mouse clicks and it is all loaded in your GPS. An evening paddle and fishing excursion on Lighting produced only a great paddle. It is not often that I strike out when fishing in WCPP. I noted that there are vast areas of Lightning, especially among the islands that are mudflats with 15 inches of water covering them. The total absents of vegetation in these areas puzzles me. There were weedless shallows in other areas also. I did spot the trappers cabin and took a picture of it and one through the window glass. It is a classic log cabin with a metal roof, which means it should stand for a long time. As visitors, when we come across these cabins they must remain untouched. Whatever your views are on the taking of furs for a living, keep them to yourself. An incident was relayed to me from a cabin near the Bloodvein. A summer canoeist went into this cabin, which many must do. Most leave a note in the journal but this person left a foul language tirade against the trapper. Soon after the trapper showed up for a visit with his young children. Just imagine his young kids running into see what messages had been left by recent visitors! !